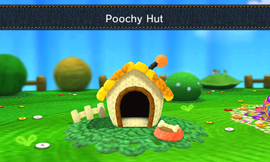 The Poochy Hut is a building on Craft Island in Poochy & Yoshi's Woolly World. The outside of the building resembles a small dog house with a yellow and orange-spotted roof, which has an object resembling Poochy's tail on it, with Poochy's food bowl and a bone sitting beside it. Here, players can play the game mode Poochy Dash, which involves playing through six different levels as Poochy, where they must try to collect as many Beads as they can. Additionally, the player can scan a Poochy amiibo in order to play bonus time missions. Players can also select different Poochy designs that they have unlocked in the game, similar to the Yoshi Hut from the original game. This page was last edited on August 12, 2018, at 23:03.